The Impossible Girl, Clara Oswin Oswald, is cheeky, spunky and courageous. She is played by Jenna Louise Coleman, and she has spent her entire existence living and dying to save the Doctor. In the Doctor Who finale, Clara sacrificed herself once again to save the Doctor from annihilation by the Great Intelligence. Determined to save her once and for all, the Doctor enters his own time stream to pull he rout. 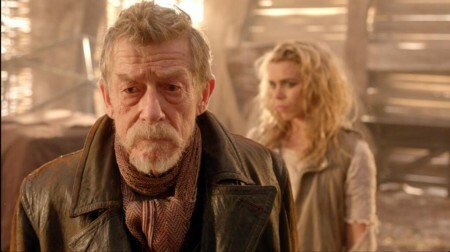 In the course of doing so, he runs into an older incarnation of himself, a Dark Doctor, played by John Hurt. When confronted by his older self, the 11th Doctor tells his Impossible Girl that the name he chose is a promise and Hurt is the one who broke the promise. “But not in the name of the Doctor,” 11 retorts firmly. The Daleks call him the Oncoming Storm. In the Gamma Quadrant, he is known as a great and fearsome warrior. We have seen the Doctor angry, vengeful and we have seen him withdrawn from the world. Doctor Who has become an unquenchable success at sci-fi conventions and pop culture. The current version of the show began in 2005 with Chris Eccelston. David Tennant picked up the Doctor’s adventures and the current Doctor, Matt Smith, the 11th, will soon be replaced by the 12th, Peter Capaldi. Capaldi is no stranger to Doctor Who, appearing with Tennant’s 10th Doctor in The Fires of Pompeii aired in 2008 as he showed his Companion, Donna Noble, played by Catherine Tate, her first trip through time. Capaldi played, Caecilius, who purchased the TARDIS. Capaldi also appeared in the spin off miniseries Torchwood: Children of Earth as government middle man John Frobisher. Billie Piper makes an appearance in the 50th Anniversary special as The Moment, the ultimate weapon of mass destruction created by the ancients of Gallifrey. We have known since 2005 that the Doctor is the sole surviving Time Lord to come out of the Time War with the Daleks. We did not know, however, exactly how he survived. We knew he destroyed his own people, his planet and the Daleks attacking Gallifrey on the Last Day of the Time War. The Day of the Doctor explores this concept in detail, showing us the extreme conflict within the Dark Doctor, the warrior who fought in the Time War and ended it by burning Gallifrey and the attacking Daleks. Whovians have always speculated on how he survived the destruction, and in The Day of the Doctor, we learn exactly what transpired on the darkest day of the Doctor’s many lives. The 50th Anniversary special aired at the exact time of the first episode 50 years ago in a global simulcast without commercial interruptions. Whovians will be delighted to know the breadth and depth of the Doctor Who mythos is explored, explained and excellently displayed during the airing. Whovians will be further thrilled by the ending, which of course leaves the door wide open for an exciting return of the 12th Doctor in the annual December Christmas special. 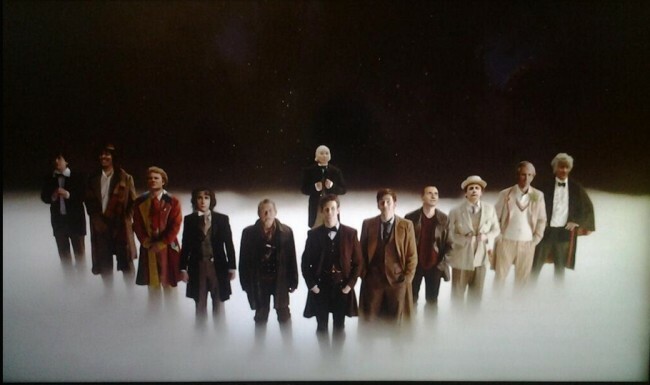 Whovians will soon have 13 Doctors in their universe. To save Gallifrey, all of the incarnations of the Doctor came together each in their own TARDIS to implement a strategy to redeem the Dark Doctor, save Gallifrey and stop the Dalek threat. We even get a glimpse of the Not-Yet-Doctor number “12” (who is actually No. 13, if you follow). How, then, if the Warrior Doctor who destroyed Gallifrey is not the first Doctor, did all of their regenerated Doctors –including the one who does not yet exist- know to converge on that particular point in space and time? Whovians, work it out. Time Lords are temporal creatures and psychic. Once the idea was conceived by one of them, the Doctor could, with the help of the TARDIS share the information with every one of his incarnations and bring them together to #SaveTheDay. 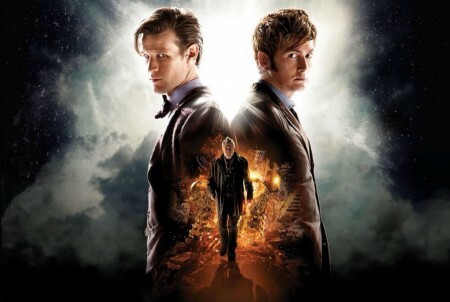 The Day of the Doctor will encore tonight –sadly with commercials–after the End of Time episodes showing Tennant’s 10th Doctor in his final confrontation with his arch nemesis, the Master. 3 Responses to "Doctor Who: 13 Faces, 50 Years [Video]"
excellent publish, very informative. I ponder why the other experts of this sector don’t realize this. You should proceed your writing. I am confident, you have a huge readers’ base already! You actually make it appear so easy together with your presentation however I find this matter to be really one thing which I believe I would never understand. It kind of feels too complicated and very extensive for me. I’m having a look ahead to your subsequent publish, I will try to get the hold of it!